Our very own Doctor Defroster has been answering defroster questions for going on twenty years. 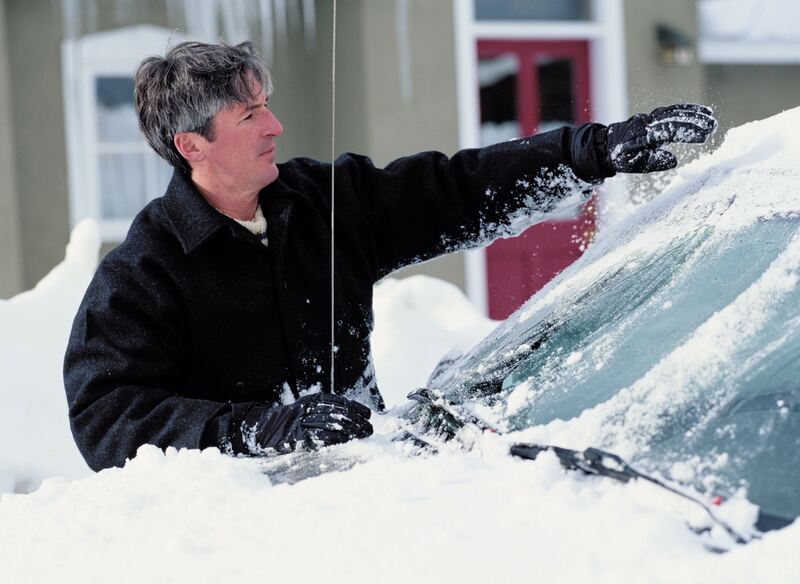 Rear window defrosters can be challenging to troubleshoot and repair. The Doc posts many of the most challenging defroster repair questions here. Questions run from rear defroster tint damage and demister tab bonding to more challenging questions of how to repair a rear defroster. The metal tab broke off the defroster grid, leaving the whole metal tab intact and still inserted into the black plastic connector. Is it possible to remove the metal tab from the black plastic connector in order to more conveniently manipulate and cover the metal tab? 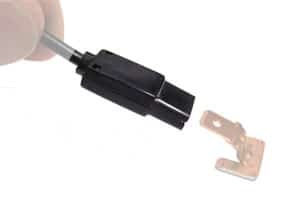 Defroster tab connectors typically are of two types, one type uses a locking mechanism and the other is a simple friction fit. Take a close look at the defroster connector with a good light and look for a small tab that when pushed will disengage the latch. On may locking defroster tab connectors the release is along the edges or on top of the connector. The trick is to push on the release tab while pulling the tab to free it. We use needle nose pliers or a small screw driver on the tab release. If nothing looks like a locking device then try pulling the tab free using pliers. Be careful not to pull directly on the wire as it can come out of the connector. Defroster tabs coming off window! Defroster over heating? I have tried several methods including another brand of tab repair kit, and soldering paste. Each time I have successfully gotten the tab to stick, but once the rear defrost is turned on, it quickly falls off. In the case of the solder, once the rear defroster was turned on it started smoking as if it was being heated by a soldering iron. My question is this: Is it possible that the rear defroster is getting too hot? I read that the rear defroster should only be heating up to 85 degrees. That is no where near hot enough to melt solder, but it sure did melt the solder I used. The solder I used said it had a melting point of 430 degrees. So, is it possible that the system is getting too hot? If so, what would cause that? Rear defrosters are designed to heat a big area of glass which requires a good deal of power to accomplish. The problem you are experiencing has to do with the resistance between the tab connector and the defroster. If there is not a good electrical connection between the defroster and the tab the resistance in this joint turns the substantial energy flow into heat. The reason Frost Fighter Tab bonding kits are successful aside from a good structural bond is that it has a very high loading of silver resulting in the highly conductive bonds required in this application. We recommend the use of Frost Fighter Tab bonding kits for this type of repair. While it sounds like a defroster disaster, this is relatively easy to repair this rear defroster. We use a screw driver, pliers and/or a soldering gun to remove the tab that is stuck to the defroster. See our Technical Bulletin on how to remove defroster tabs. It is not absolutely necessary to remove broken defroster tabs as the new tab can be bonded on the defroster next to the damaged tab. Once the tab is off and the bonding site is clean, mask off an area around the damage using masking tape. Use the 2000 Frost Fighter Tab Bonding kit to reattach the tab. Mix the two part silver adhesive and apply to the defroster inside the masked off area. Squeegee flat with a mixing pad. This repairs the missing section of the defroster. 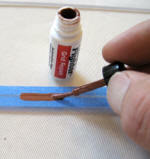 Pull off the masking tape and put a little silver adhesive on the tab, then place it into position. This should be done in one step and the silver conductive glue sets quickly. Wait five minutes for the bond to start the cure then use the hair dryer, lamp or other means to cure the bonding site (100-120F 30 minutes) and your back on the road. Car runs on 24 volts, what about a 24 volt defroster? As luck would have it we are introducing new 24 volt defrosters and defroster controls. See the following webpage for 24 volt rear window defrosters. See Clear View 24 volt defrosters. The defroster circuit has a place of high resistance (impedance) that looks fine on a volt meter but goes to zero when a load is applied. Here is what to do to troubleshoot this problem. With the defroster on and connected to the vehicle, measure the voltage between the tabs at the sides of the defroster. This should be less than a volt or two. Now measure the voltage between the negative tab and a known good ground on the vehicle. If this shows 11-13 volts the problem is in the ground side of defroster. If the voltage is still zero then go to the next step. Connect the voltmeter between the positive tab on the defroster and a known good ground. If the meter reads the same low voltage in step 1 then the problem is in the positive side of the defroster circuit. The new Clear View II defrosters come in over 150 sizes so finding a defroster for your VW Beetle will be easy. 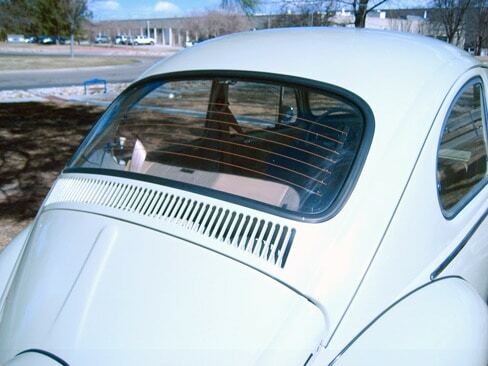 The VW Beetle back glass varies between model years. The 1965 to 1971 including the 1971 Super Beetle are 35 inches wide and 15 inches tall. The defroster you should look at is a 1209-3247. This is a modulated defroster and requires the ThermaSync control which is included along with wire harness. Can I just get the defogger grids? Sorry but it’s not possible to replace individual defroster grids with Clear View grid elements. The Clear View defrosters have their own vertical side buss bars and these need to be used as they are important in setting the overall electrical resistance of the defroster hence the defrosters heating performance. Most grid damage can be repaired using the Grid Repair Kit. If the defroster is damaged beyond repair consider Clear View Defrosters. This is a little unusual as normally the vehicle’s back glass was replaced and they just “forgot” to use a window with a defroster. Both these can be easily fixed. In the first case where the car has a defroster but no defroster wiring, order a 2712 ThermaSync defroster control and the Installation Wire Harness Pack. This is everything you need to connect and run your defroster. In the second case, the car has the defroster circuit but no defroster, use the Clear View STICK Kits on the back glass connecting the defroster to the existing circuit and switch. The stick kit part is important as these defrosters do not require power modulation and can run on the native voltage of the vehicle. Larger breaks in defrosters are repairable using the Defroster Grid Repair Kit. Repairs in 3-5 inch (7-12cm) range are common. Fix a few lines and give it a try to see how the defroster is working. Grid repairs using the Frost Fighter kit is not an all or nothing proposition. It is easy to go back and increase the defroster performance by re-applying the repair material if needed. You are on the right track. Use a hair dryer, heat gun, heat lamp, lamp, shop light or what ever to put some heat on the tab repair site to cure the silver defroster tab bonding glue. This can be done inside of outside the vehicle for 30 minutes at 100-130 degrees F (43-54) for 30 minutes. Use a fixture to hold the heater as needed and check the site occasionally to make sure it does not over heat indicated by being very hot to the touch. The short answer is yes. The back window can be defrosted using any of the Clear View defrosters. See the Clear View Defroster Order Guide to select a defroster that will fit this window. The tall/narrow side windows can be defrosted using a narrow defroster placed vertically in the glass. Why do you yanks insist in calling them defrosters? To embrace our friends from overseas here is a list of words that we think means “rear window defroster” in several languages. For more information on new or replacement defrosters see Clear View Defroster Kits. See our How to repair a rear defroster fix it guide for information on defrosters and repair. For troubleshooting and repairing rear window defrosters have a look the Doctor Defroster video series. This series shows you how to repair rear window defrosters and get back on the road in no time. Now showing!